When about 43 Philippine police commandos were killed in an 11-hour firefight with Muslim rebels last 25 January 2015 was reported, it was considered by Interior Minister Manual Roxas as "the single largest loss of life in recent memory by our security forces." However, this is not the bloodiest and most violent encounter for the Armed Forces of the Philippines (AFP) in the last four decades. That distinction belonged to the massacre of about 119 officers and men of the Philippine Army’s 31st Infantry Battalion that were deployed to Pata island off Jolo on 12 February 1981. As a result of the loss, both the Navy and Air Force retaliated by shelling the island for almost two months. An estimated several hundreds to 3,000 civilians were reportedly killed. The incident was recalled in an article by Retired Major General Delfin Castro who served as the Southern Command from 1980 to 1986. 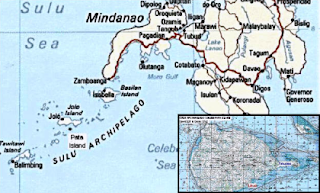 According to the General, the 3rd Brigade of the 1st Infantry Division (ID) had launched an operation in Pata Island on 9 February 1981 in the wake of reported landings of an undetermined number of Moro National Liberation Front (MNLF) forces somewhere at Barangay Pata Likud. The 31st Infantry Battalion (IB) was at the forefront while two other battalions were screening the mainland side. The Brigade set up its Advance Command Post in Patian Island, the next island away from Pata. After the Philippine Army arrives, Mayor Burahan of Pata called a meeting of island leaders in Barangay Saimbangon on 10 February to assess the situation. Among those who attended were Vice-Mayor Ombra Tagid-gid, Omar Ali, Faisal, Issa, Kadaffy, Salahuddin, Moharam and Civilian Home Defense Force (CHDF) Commander Unad Masillam of Pata Likud. The CHDF was originally conceived to form part of the Philippine Constabulary (PC) as a civilian auxiliary force. Under the current structure of the AFP then, the task of training, organizing, and management of the CHDF would fall under the PC. However, due to various human rights abuses created by the CHDF, the late President Corazon Aquino signed in 1987, executive order no. 275 ordering the demobilization, deactivation, and dissolution of all units of the CHDF. Barangay leaders denied presence of rebel elements in the in their barangays and assured that no MNLF forces had landed. After the meeting and carful inspection, the 31st IB began to pull out on February 12, leaving only the Headquarters Service Company of the battalion Commander Lt. Col. Jacinto Sardual. Before the last remnants of the military leaves the island, there was an unsubstantiated reports that reached Commander Unad Masillam alleging that the military is planning to confiscate all their firearms. This prompted the CHDF head to call a meeting at his residence with his trusted aides Omar Ali, Faisal, Issa, Kadaffy, Salahuddin, Moharam and his son Dindiong Masillam. The first mystery involves the question on how this rumor came about or how the details of the disarmament can be carried out considering that most of the Philippine Army has already left the island. It widely believed that the report was falsified by Commander Unad himself to provoke his auxiliary troops in opposing the PA. The meeting was going on when Lt. Col. Sardual arrived to pay his respect before leaving with the rest of his troops. Commander Unad and more than 400 of his troops then accompanied Lt. Col Sardual back to his camp as a show of courtesy. Inside the military camp, Commander Unad asked Lt. Col Sardual if he can form his company up as a formal gesture of farewell. Her also ask the officer to ensure that the military personnel not to hold any firearms to allow his to shake all of their hands. The second mystery behind this incident is on the reason behind why Lt. Col. Sardual followed Commander Unad’s request when it goes against all norms and tenets of combat common sense. Equally disturbing is why his junior officers in turn passed the questionable order to the enlisted men under their command. Was Lt. Col. Sardual threatened and under duress when he issued a command for his men to join the company formation without their firearms? While the most of the soldiers stood in formation, their arms neatly stacked, Commander Unad’s men quietly formed a ring around them and let loose searing volleys of automatic fire. With comrades shredded and falling dead or injured, the remaining soldiers who did not join the formation returned fire. Unfortunately, their efforts are not enough and they had to scamper and fall back. When the smoked cleared and the guns fell silent, 119 officers and men lay lifeless, including that of Lt. Col Sardual. The headquarters service company of 31st IB ceased to exist in a matter of minutes. Some bodies were mutilated and burned, while others were looted for their uniforms, shoes, wallets, watches and other valuables. Over 120 firearms and over a million rounds of assorted ammunition also fell into Commander Unad’s hands. The Pata massacre was a classic execution of one of Misuaris’s stratagems which is for certain MNLF elements to falsely pretend that they are joining the government and at a given opportunity, to sabotage the returnee program from within. However, the military’s response was equally brutal when former President Ferdinand Marcos ordered the Philippine Air Force (PAF) and Philippine Navy (PN) to support the landing of troops with constant barrage of explosive shells. The result, thousands of civilians were caught in the cross fire, while Commander Unad and his son Dindiong slipped away from the island. They were later given important positions in the military hierarchy of the Nur Misuari’s MNLF faction. Pata Likud was reported to be still controlled by Commander Dindiong Masillam. 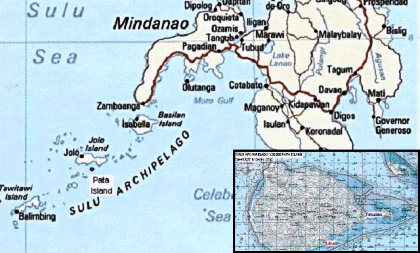 There was a heated rivalry between Dindiong and the Burahan family which controls the Poblacion proper of the island. The conflict started when Dindiong decided to challenge the incumbent mayor of Pata during the 1998 elections. Eventually, Dindiong lost to Burahan in the elections.